The Eye See…Eye Learn® program is dedicated to making sure that parents across Canada understand the importance of regular comprehensive eye exams for children. The program encourages parents to book their child a comprehensive eye exams with a local, participating optometrist. There is no out-of-pocket cost for the eye exam. If a child needs glasses, they will receive a complimentary pair donated by Nikon Lenswear, OGI and the participating optometrist. Estimated value of the glasses is over $250. The Eye See…Eye Learn® program was developed to teach parents the importance of having their children’s eyes checked before starting school. Each year, thousands of children start school without ever having an eye exam, even though 80 per cent of learning comes directly through vision. In fact, children who cannot see the board, focus on a picture or follow words in a book may struggle to achieve their full learning potential. Sadly, one in four school-aged children has an undetected vision problem that is affecting their learning. 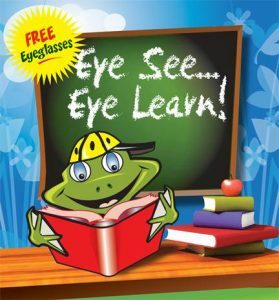 There is an important link between eye health and education, and the Eye See…Eye Learn® program helps ensure kindergarten students get the best start to learning.